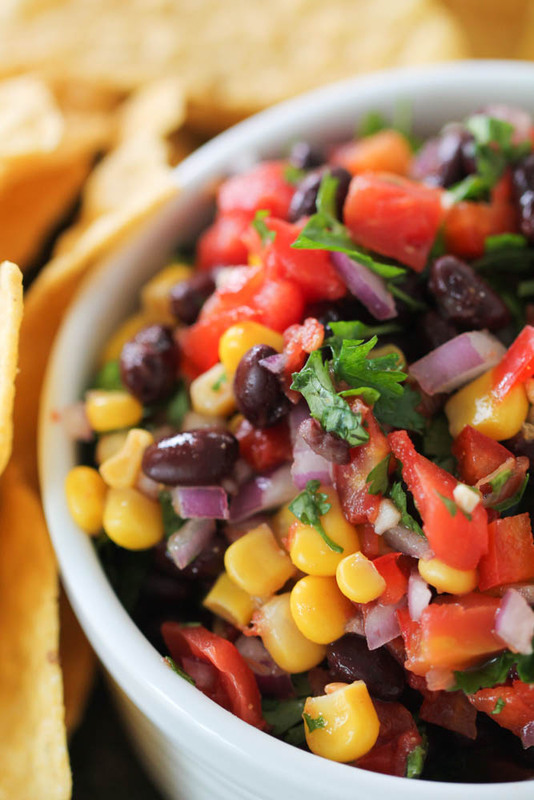 This Easy Black Bean and Corn Salsa is full of flavor and can be made in less than 10 minutes! 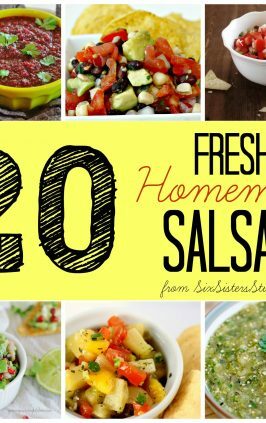 This homemade salsa is made with black beans, corn, red onion, cilantro, peppers, RoTel and more. 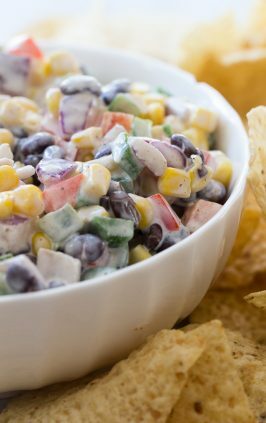 We love serving this Black Bean and Corn Salsa with tortilla chips, but it also goes great served over grilled chicken. However you serve it, it’s sure to be a hit at your next barbecue or potluck. 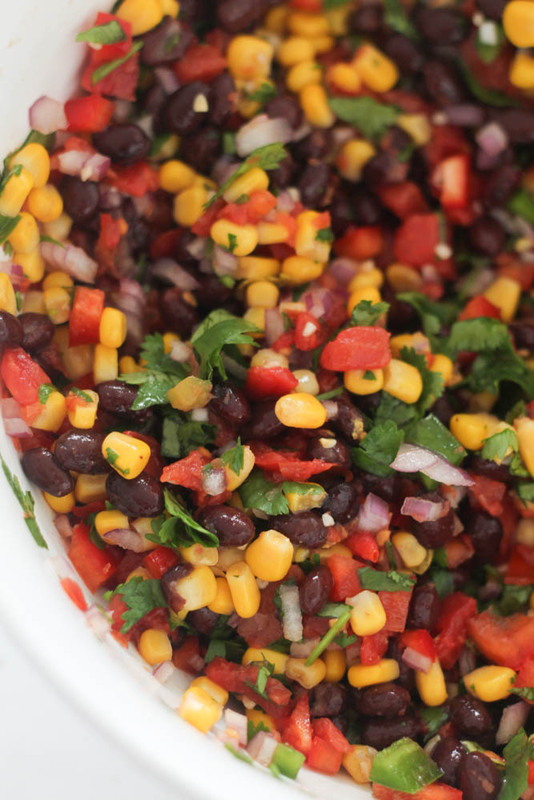 This Black Bean and Corn Salsa is surprisingly easy to make! 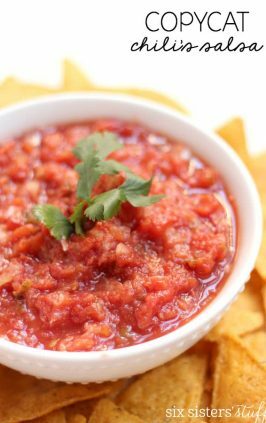 I love that this easy, homemade salsa uses fresh and canned ingredients because I typically keep a lot of these ingredients on hand and can whip this up whenever I’m craving it. 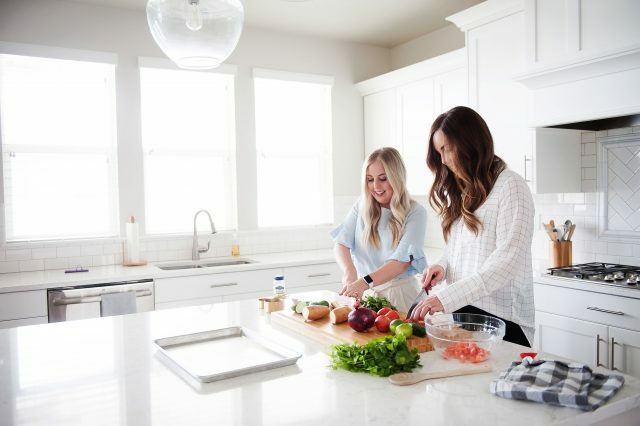 The most important thing to remember when you’re making this salsa is that there is no blending or food processing involved, so however the vegetables are cut is the size they will be when the salsa is complete. I like to mince my onions so the flavor isn’t too overpowering with each bite of the salsa. Be sure to thoroughly rinse your black beans before adding them to the salsa with the other ingredients. I usually pour the can of black beans into a strainer and let water run over them until it runs clear. You also want to be sure to thoroughly drain your other canned goods so there isn’t a lot of extra liquid in your salsa. 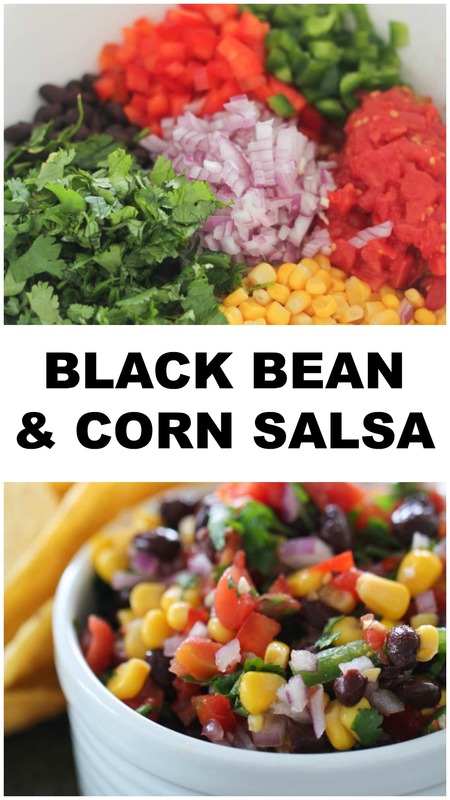 I love that this Black Bean and Corn Salsa can be made in 10 minutes or less. The hardest part is cutting up the vegetables! To make the salsa, simply mix all the ingredients together in a large mixing bowl and toss until well combined. 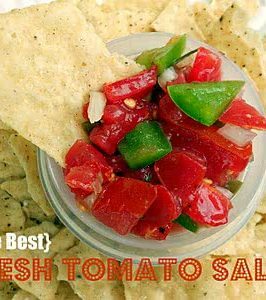 Be sure that the lime juice and cumin are evenly distributed throughout the salsa and store in the fridge until serving. 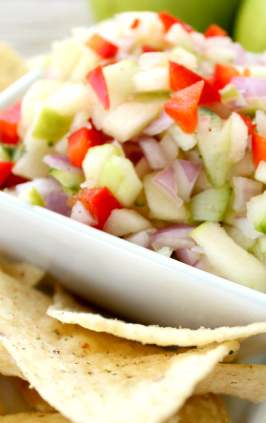 This easy salsa is so good, we could eat it with a spoon! However, we prefer to serve it with a side of tortilla chips. This recipe also goes great with our Slow Cooker Chile Colorado Beef Burritos, Our Family’s Favorite Taco Salad or our Easy Chicken Street Tacos. 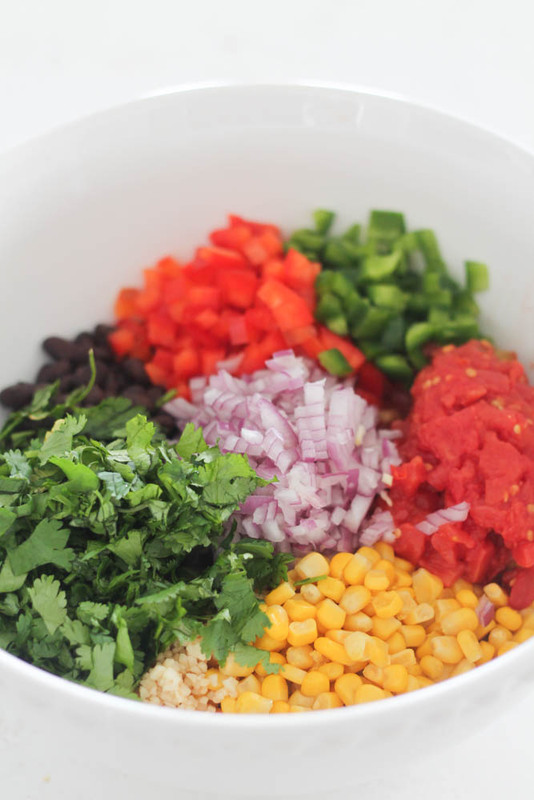 This homemade salsa is made with black beans, corn, red onion, cilantro, peppers, RoTel and more! In a large mixing bowl, combine all ingredients until fully incorporated. Store in the refrigerator until serving. Hey girl, your salsa looks so good... I'm so happy you like me, you really like me. I am already a follower of you and your sister's blog. I wish I lived closer to Utah so we could all get together and create. Thanks for the love. I just made it this past weekend!! I tweaked a few things (aka forgot some ingredients) and everyone loved it! I have a recipe that is almost the exact same, and I love to eat it on top of carne asada tacos. Amazing! I love black beans they are so nutritious and full of fiber. I have recently increased my fiber intake and lost 36 pounds. And I have added in so many recipes with black beans because of their high fiber intake. Fiber is so important to your diet especially when you are trying to lose weight. I plan out my meals and track my calorie intake which helps me stay on track. I make a salsa almost just like this. However, mine doesn't have avacado or lime juice in it. It has feta cheese in it and it's all mixed up with a packet Good Seasons Italian dressing prepared. It gets rave reviews every time! I found this recipe on the RoTel can and love it. It is delicious as a side dish, too, and great for my lunch with WAY BETTER (brand name) multi grain tortilla chips. Talk about getting your fiber in for the day, this definitely does it!